Lamington purists look away now. In fact I’ll be the first to admit that my “Lamington” chocolate eclairs are about as close to lamingtons as I am to winning the lottery or ever realising my dream of escaping to live in France (i.e. not very close). I did however want to do something to pay homage to Australia day, and our national cake – the lamington, but the sad fact of the matter is, as much as I love cake, I don’t like lamingtons. In my experience lamingtons are dry, crumbly, and, well, not particularly exciting. And their dryness, mixed with the coconut coating always has me reaching for a drink to wash it down. I’m willing to admit however, that perhaps I’ve just never had a good lamington. So if you’ve come across a really great lamington, or lamington recipe, let me know in the comments. 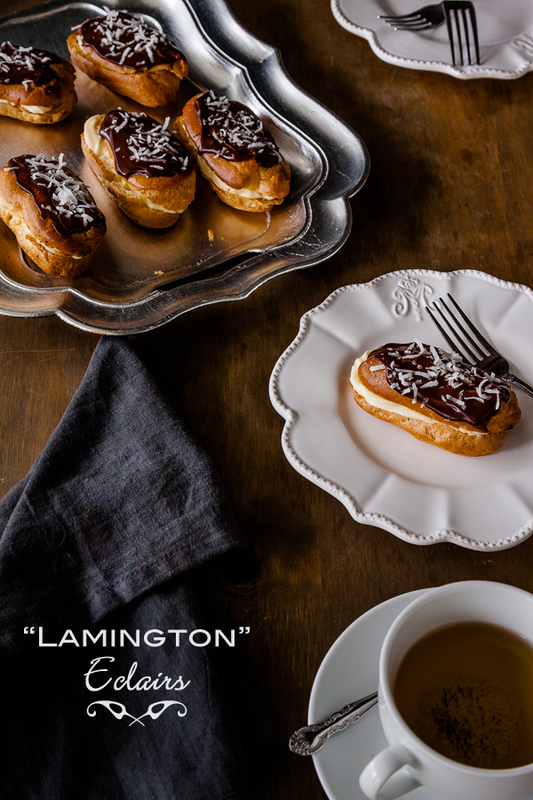 I hadn’t intended on making anything to celebrate Australia day, but the idea of lamington chocolate eclairs popped into my mind the other day, and I was unable to get it out. Despite the fact I’d never made eclairs before I wasn’t perturbed. In fact, I love the challenge of making something for the first time, and learning a new skill. Choux pastry isn’t completely new to me, after making a couple of batches while I was trying to recreate a gnocchi Parisienne dish I’d had at a restaurant. The trick to making choux is beating the eggs into the butter and flour mixture really well. I tried to do this the first time by hand, and, well, the result was a goopy liquid mess. Clearly my arms aren’t up to the task, so the next time I switched to using my KitchenAid to do the job for me, and my choux came out perfectly. My chocolate eclairs aren’t perfect, but neither am I. They have bumps where they should be perfectly sleek and smooth, however they still taste pretty darn good, and honestly, that’s all that matters sometimes. Makes roughly 14 eclairs. Choux recipe from here and vanilla pastry cream recipe from here. To make the choux pastry, preheat oven to 220 celsius (420 Fahrenheit) and line 2 trays with baking paper. Place the butter and the water in a saucepan over medium-high heat. When the butter has melted add the flour and beat continuously until mixture is thick and smooth and pulls away from sides of pan in a ball ( roughly 1 minute). Remove from heat and place in the bowl of a stand mixer and allow to cool for 5 to 10 minutes. Fit the mixer with a paddle attachment and beat. The mixture will look like it’s falling apart, but don’t fret, it will come back together when you add the eggs. Add the eggs, one at a time, and beat for 2 minutes, or until fully incorporated before adding the next egg. At the end you should have a relatively thick, but pipe-able dough. If the mixture is runny or sloppy keep beating. Spoon the choux into a piping bag fitted with a 12mm plain nozzle and pipe into 10cm lengths onto the prepared baking trays, leaving about 2cm in between each one. Bake for 10 minutes, reduce heat to 180C, prick bases with a skewer and bake until golden and dry ( about 20 minutes). Place on a wire rack to cool. To make the vanilla custard cream filling, whisk the egg yolks, sugar and flour in a bowl until combined. Place the milk in small saucepan over a medium high heat and bring to just below boiling point. Remove the saucepan from the heat and reduce the heat to low. Gradually whisk hot milk into the egg yolk mixture until combined before returning the mixture to the saucepan. Cook, whisking constantly, over medium heat until thickened and the mixture resembles a thick custard. Strain through a fine mesh sieve into a bowl and cover with plastic wrap to prevent skin forming and refrigerate until cold. Whisk the cream and vanilla seeds with electric mixer until peaks form. Fold the cream into the cold custard and spoon into a piping bag. For the chocolate glaze melt the chocolate and butter in a small bowl over a pan of barely simmering water and stir until smooth. 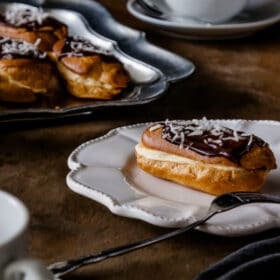 Cut each eclair in half and spread the top half of each eclair with chocolate mixture, sprinkle with coconut and allow to set. Just before serving, pipe the custard cream filling into bases and replace chocolate tops. If you want to skip the pastry cream fill the eclairs with whipped cream flavoured with vanilla seeds. A dollop of strawberry jam would be a delicious addition too. 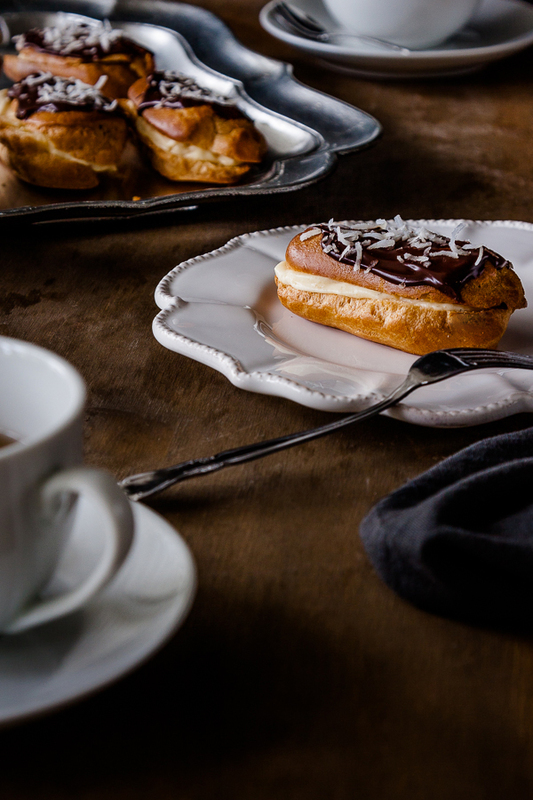 Your eclairs look beautiful and I love the chocolate glaze! These look much more appetising than any lamington I’ve ever seen! They really do look delicious. They look pretty perfect to me Jennifer! If you find yourself in Sydney any time in the future you have to go to Flour and Stone and have a panna cotta lamington. They are amazing! I hate to admit it but I too struggle with lamingtons. In theory they’re great, but they’re often as dry as cardboard and the chocolate coating rarely resembles anything remotely similar to chocolate. I too hold out hope that maybe there are delicious lamingtons out there. My husband hates spongecake so I’ve never attempted to make them. This year we’ll be making a Tim Tam cheesecake with burnt caramel sauce as my tribute to the Australia Day gods! I do love eclairs though so I might have to give these a go on the upcoming lazy Monday! I think they look magnificent! If they taste half as good as they look, they’ll be gone pretty quickly!